Overcome the perception that Pav & Broome Diamond Jewelers had closed or gone out of business and increase first quarter sales by 10% with no increase in the current budget. In order to accurately pinpoint the perception by Pav & Broome’s customer base, Ad2 developed a direct mail survey, which included an offer as incentive for high rate of response. The survey was mailed out to more than 3,000 customers with a response rate of more than 3%. This gave us a great sampling of the market and provided us with tons of useful information for the marketing plan. The first step was to shift the existing advertising budget to minimize costs and maximize results. We budgeted for a :60 television commercial, which would then be spliced into :30’s, :15’s and :10’s and later used for holiday and general marketing spots. 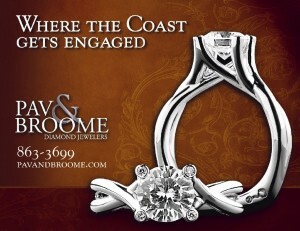 The TV spot was meant to tell the story of Pav & Broome Diamond Jewelers and their 30 year history. It was a warm spot that families could relate to and remember why they trusted the local jewelers. The shift in the existing advertising budget increased the reach of their target market from 47% to 78.4% and increased first quarter sales by 11.4%. The television spot created just the kind of emotion we were hoping to stir with people “coming in that hadn’t been in in a while” and some even admitting the commercial “brought a tear to [their] eyes”. We were once again able to maximize their advertising dollars by using the footage shot for this commercial in other later spots. 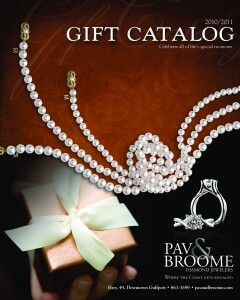 Position Pav & Broome Diamond Jewelers as the premier jeweler on the Gulf Coast. Ad2 created a brand that was uniquely Pav & Broome Diamond Jewelers, although several competitors tried to mimic the look-and the results-throughout the campaign. We began by redesigning the logo. We then ran an image campaign including several different concepts using the new look, which included outdoor, direct mail, web site, newspaper, premier placement in magazines and even a revision of the earlier TV commercial. Once again, quarterly sales were increased, and Pav & Broome Diamond Jewelers has earned the designation as the premier jeweler on the Coast.